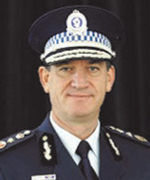 I have been the Commissioner of Police in New South Wales for seven years. When I consider my career, the role of Commissioner of Police wasn’t necessarily a goal that I had – but looking back, God’s plan is clearer now – I was placed into that position more as a ministry than as a job. My family were what’s referred to as ‘ten pound poms’. My father emigrated from the UK and I followed with my mother and sister. We moved into the Western Suburbs of Sydney where I grew up as a young boy and had a wonderful time. My heritage is mixed – we came from England. My father was born in France of Italian parentage, Italian-French parents. Mum came from a little town called Lurgan in county Armagh, right on the border between Northern and Southern Ireland. We arrived in Australia knowing no-one. We weren’t a church family, in fact, I don’t think I set a foot inside a church until I was about 10 or 11. I will never forget my introduction to church through some neighbours. A young couple of Christians moved in next door and when they moved in, they let everyone know they were Christians. They were youth leaders in a local Baptist Church two suburbs away. They would, from the very beginning, ask me to get involved. ‘Do you want to come to church?’ A young boy, I had no reason not to and I started going to Boys Brigade. At 14 I made the decision to give my heart to Jesus after a youth Bible study night. I can still see the chair that I sat in when I made the decision. In all honesty there were other reasons for me to be a big part of that group. I learnt that youth groups actually have lots and lots of girls in them. There was one very special girl in there that I didn’t realise how special she was because at that time I didn’t really know she was that special, but she is, and she is with me today, my wife, Joy. It was a little while before we became an ‘item’, but Joy was one of the girls in that youth group who meant a lot to me. After making the decision to become a Christian, I lost my dad three months later and I was left very alone – simply Mum and I – effectively we had no one else in Australia. I went from being a boy to a man overnight. Although I wouldn’t know it then, I was so blessed that I had God there behind me. I mentioned my wife Joy and she made a very big impression on me. When my dad passed away, I remember she came to visit me, from memory; Joy came to the door and basically cried. It was as simple as that. But the care and the love, that stayed with me. We obviously became an item, we married when we were quite young and we’ve been blessed having been together 35 years now. God has truly blessed us. I want to address: ‘Watch out! You are being watched.’ Before I made that decision where I said, ‘I give my heart to you, Lord’, I watched other Christians. After giving my heart to the Lord and my father passed away, my mother watched me. Although she wasn’t a church-going woman, after my father passed away she said ‘I’ve been watching you and you’re a different boy. Still trouble, still problematic, still a teenager growing up in the Western Suburbs of Sydney, but different than what you were.’ Two or three years later she gave her heart to the Lord. Because she was watching, she was observing. I guess that was one of the things starting to emerge in my life, the importance of knowing we are being watched. If you are a professing Christian, people are watching. As Christians we carry not just the Lord’s name, but the brand of Christianity. And the responsibility to our Lord and fellow Christians. People are very quick to say, ‘And there’s another problem, these people that profess one thing and do something different.’ We all carry that. We carry the good name of the Lord, the Saviour and our Father. We need to make sure that we handle it with care, both in private life, in professional life, when the lights are ‘on’, and when the ‘lights are out’. After my father passed away I assure you that life went on. Like many, once I became a Christian, it wasn’t simply a ‘happily ever-after’. I was soon to be confronted with very real challenges. I went from being a boy to a man very quickly, almost over-night it seemed. As a 14 year old boy I needed strong male influence to teach me how to live this life, particularly as a Christian man. I was so blessed. The church that Joy and I were a part of had three or four really strong Christian men in it that mentored me; giving me all of the clues, all of the detail by the way they were living. I saw how to be a Christian man. They taught me how to be a man. They taught me how to be a husband. They taught me how to be a father. These Christian men were the role models in my life that I know made the difference. They were the men that taught me. The DNA had been torn away and there needed to be something to replace it. God saw to it. Those Christian men in my church made the difference. They adopted Joy and me into their families almost as their kids. Again, we were so blessed. Those men have gone home and one day I am looking forward to being able to say hello again and to fellowship with them in heaven. I can recall talking to one of those men in Calvary Hospital, almost on his death bed, and saying to him, ‘Thank you. Thank you for what you invested into me because I’m reaping the benefit.’ It’s by God’s grace and godly, obedient men investing in a young man’s life that I’m well placed to be able to make good choices. My career continued, but this isn’t about my career, this is about what God has done in our lives. My career progressed and I have served in every rank in the New South Wales Police Force. I rose to the rank of Chief Superintendent at a very young age. I can recall taking a phone call from the then Police Commissioner, Peter Ryan, it was in 1997. He said, ‘I want you to come into my office.’ Usually that’s not good. That’s like CDF David Hurley calling up and saying, ‘You need to be in my office at nine o’clock in the morning.’ Not much good usually comes from those sorts of phone calls! I was called by the Commissioner personally and I had only met him once before. I went to his office and he asked me to be his Chief of Staff. At the time there was no guideline, no proforma, and no strategic guidance. Originally, the plan was for a short term position, which extended to over three years. It was a wonderful opportunity to witness, to explain to the Commissioner of the NSW Police Force what I had been through. I recall speaking to the Commissioner before the appointment was announced as permanent where I said to him; ‘Before you make this permanent, you need to know a little bit about me.’ I said;, ‘I’m sure you don’t expect me to, but I need to tell you that I won’t lie for you. I won’t cover up anything for you. I’ll never do the wrong thing by you. You won’t catch me on the front page of the newspaper for some scandal because that’s not the way that Joy and I live our lives. We are Christian men and women.’ And he said; ‘That’s exactly why you are here.’ I didn’t know him. ‘How did you know me?’ I asked. He said; ‘I reached back to the UK. You trained with some people in the UK years before and when I reached back they said, “There is a young guy down there that you need to have working for you.”’ In fact it was an attachment to a military installation that the Commissioner reached back to. That was where he had received his information. People watch you. Today, I’m the twenty-first Police Commissioner in New South Wales. My team is smaller than the ADF. I manage just over 20,000 people in the State of New South Wales. The NSW Police Force is a modern organisation, formed in 1862, the varying police services; border police, mounted police, Sydney night patrol, water police, all ‘merged’ into a force of 800 men, The police force was only men then. Today, of the just over 20,000 people, a third of them are women. So why God would put Joy and me in this role, because what I do is not just about me, it is about us, this is our ministry. Joy gets the rough end of the deal as every medal I’ve ever had presented to me really should go first to her because she has had to endure me not being there. Me being there, but being absent because I’m on a phone or dealing with a crisis. Not by design, but by default, cutting her out of the show. Military families and wives I’m sure would see that because I know Police wives see that, particularly the higher up the corporate ladder you go. So, why? How is it to be? Why should God put me in charge? As I said, I was just a kid who came here in a boat as a baby, now in charge of the biggest police force in Australia and probably in the Western World, the fourth or fifth biggest in the world when it comes to sheer numbers. I don’t know. But God is the God of ‘I don’t knows’. He looks after those things, I don’t need to worry, because that’s his business. I say to people and I say it with all sincerity; ‘The job that I do is not about me. This role I’m in is not about me. This Police Force that I’m in command of is not mine, it’s yours.’ The community own the NSW Police Force, not me. I’ll own it one day, when I hang up my uniform and take a pension, that’s when I’ll own it because then I’ll become solely a citizen. That’s when I’ll have a guiding interest that comes from a desire for my state, my family to be kept as safe and secure as we can be. Until then, I’m in service to you. My organisation is in service to you. So the wonderful privilege that I get to lead 20,000 men and women to serve you is second to none when it comes to my profession, my chosen profession as a Police Officer. In service though, I can never lose sight of the fact of the one that I truly serve. It’s the God that delivered me when I was a 14 year old boy. That had his hand on my life before I was born, before I knew him. He took me through the loss of a father. He took me through a marriage, which then grew into a responsibility as a father for my own children and he brings me to the point where today, I am the NSW Police Commissioner. I’m not a Police Commissioner who happens to be a Christian; I’m a Christian who happens to be a Police Commissioner. That will never change because long after I’m a Police Commissioner who’s retired, I’ll still be Joy’s husband, I will still be a father to John, Ben and Emma, I will still be a member of George’s River Community Baptist Church, I will still be a member of society and I’ll still be forever indebted to my Lord and my Saviour. In concluding I want to send a message to Christian men. Our biggest problem, your biggest problem, my biggest problem is right now in this day and age, in this wonderful country, in this world that we live in, we’re not holding up our end. We are letting down our families and we are letting down our communities. God calls us to be men of courage, the theme of this seminar – Strength and Courage. Before I presented at the seminar I was talking with Joy and she said; ‘Strength and courage are joined by choice. You’ve actually got to choose to make that decision to be strong and courageous.’ Where are the men? Where are the real men? Where are the men leading their sons, growing their sons, like those three or four men did for me when I lost my father, into the men that we are called to be? Where are they? I think there is more that we can do. We need to sort of ‘man up’ in Christ’s name and understand that we do need to be strong, to be courageous, to lead our families. We do need to be there and cherish those wives that have taken our name and given their all to support us, particularly if you’re in service like the ADF or in my profession. The responsibility is great, but the strength to do it, the grace to make it happen and the support that you need is there. It’s there and available to you. God will make it abundantly available to you and bless us all in ways that we probably have never thought possible. The following article is based on Commissioner Scipione’s presentation at the MCF Seminar in 2013 and was published in the Crossfire Magazine no.25 – June 2014.